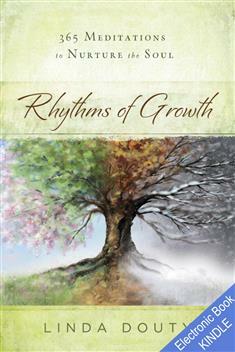 In Rhythms of Growth, Linda Douty uses the seasons of the year to illustrate natural trends in our spiritual lives. For winter, she writes about themes of rootedness, fallow times, reflection; for spring—awakening, planting, new growth, storms; for summer—bearing fruit, abundance, blossoming, weeding, and pests; for fall—letting go, sifting, harvesting. Douty's conversational style and ability to bring together the everyday and the holy make this book appealing for anyone who wants a devotional book that is applicable to everyday life.